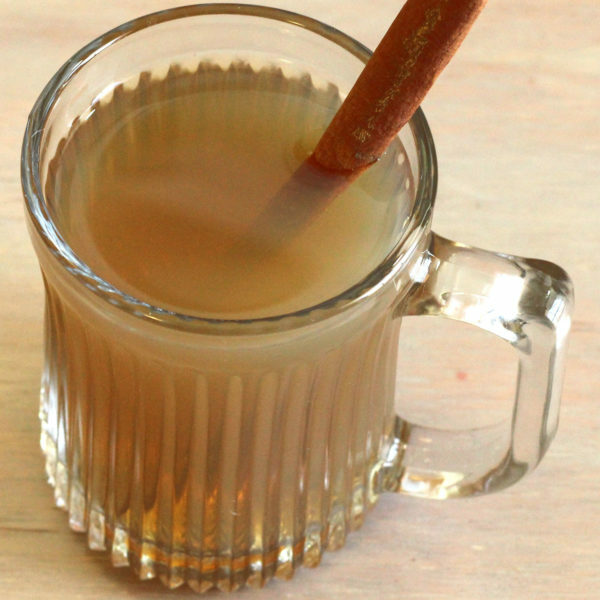 The Hot Buttered Rum is a classic cocktail which is due a revival. Like Bulletproof coffee, it calls for you to melt butter right into the drink. Does that sound a little gross? And maybe really fattening? Well, if you like the taste of Butter Rum Lifesavers, this drink has kind of the same flavor. Which is not gross at all. As for fattening, I’ve got good news for you: turns out butter is good for you! Okay, it’s still high in calories, but it’s not clogging your arteries like scientists once thought. It’s healthier than some of the ingredients in butter substitutes, And if you get grass-fed butter (which is so tasty) it has Vitamin K, which is good for you in many ways. And all of that is why it’s about time for the classic Hot Buttered Rum to make a comeback. It’s a perfect drink for autumn or winter. It belongs next to a nice fire, or out on the deck on a crisp, clear evening. It would even work around a campfire. Whatever the setting, a Hot Buttered Rum makes you feel more cozy. Like Mulled Wine, this is one of those cocktails that’s easy to make in a big batch. It really kind of lends itself to that. So I’m going to give you the big batch version ahead of the standard. Put the butter, sugar, cinnamon, nutmeg, cloves and salt into a bowl. Cream them together with a mixer. Refrigerate until the mixture is almost firm. Spoon two tablespoons of the mixture into each of twelve small mugs. Fill the mugs to the halfway point with the rum (should use about three ounces of rum in each mug). Fill the mug the rest of the way with boiling water. Stir well and serve. And now for how to make it one drink at a time. There are several variations on this recipe. This is the simple, classic version, featuring rum, butter, lemon and cinnamon. Put the cinnamon stick, lemon peel and rum in a mug. Fill it with boiling water (leave a spoon in the mug so the glass won't break from the heat). Float the butter on top, then stir it in. Or serve it with the butter floating and let your guests stir it in with their cinnamon sticks. Well tryed last weekend with a bunch of friends cause it was very cold night!